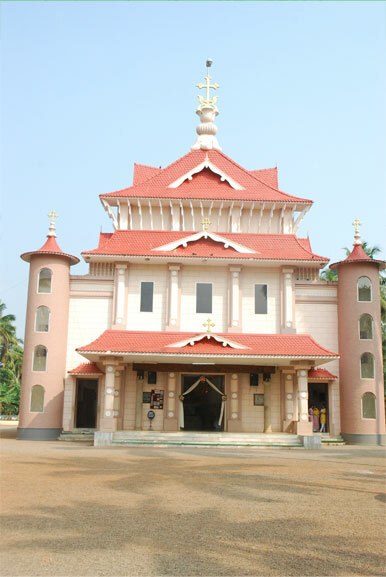 Holy Cross Shrine is located in Thrissur district and was constructed in the year 928. This church was finally renovated in the year 1989. This is one of the oldest church in India and one of the few churches in Asia that has obtained the relics that are related with the death of Jesus Christ. It includes the Holy Cross, part of blood of Jesus and a piece of towel that was used by veronica to wipe Jesus’s face. It was donated to the church by the Pope of Vatican. This church is part of the Irinjalakuda diocese and attracts huge devotees. An important ritual here is the offering of candles. Candles that are as huge as humans are offered here which is very rare function. The annual function is known as ‘Thiritheliyikkal’ which means the lighting of the candle. It is estimated that around 500 huge sized candles and 1 lakh normal candles are lighted here in a year on this occasion. People from all regions come to this church. Some other attractions during this festival are the lighting of fire crackers, processions etc. This church has got some records which include one Guinness record and 2 Limca records. The record for the largest candle in India according to the Limca Book of Records is from this church. This candle has a weight of 1079 kgs with a height of 22 feet. On September 14 when the Exaltation of the Holy Cross is celebrated, this church celebrates the feast.